Nina Simone (vocals and piano) with Jimmy Bond (bass) Albert “Tootie” Heath (drums) on CD 1. The orchestras of Bob Mersey and Ralph Burns, CD 2 and Al Shackman (guitar) Chris White (bass) Rob Hamilton (drums) CD 3. Recorded at various locations between 1959 and 1961. This handsomely packaged album undoubtedly contains some of the `high priestess`s` best songs but this is much more than a `best of ` compilation, reproducing, as it does, four complete albums and excerpts from another two. 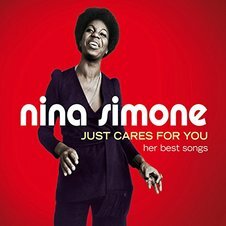 The complete albums are her 1957 debut `Little Girl Blue` , aka `My Baby Just Cares For Me`, `The Amazing Nina Simone`, ` Nina Simone Sings Ellington`, and `Nina Simone at the Village Gate` whilst the remaining tracks are taken from two of her concert performances, `Nina Simone at Town Hall` and ` Nina Simone at Newport`. The set provides a comprehensive coverage of her early work and demonstrates that she was a singular and powerful performer from the get go even before her repertoire started to reflect and comment upon the tensions and divisions in American society. In these discs she applies her unique vocal style to the interpretation of ballads, jazz standards, blues, spirituals and folk songs investing them with a depth of emotion that imparts an epic quality to even the tritest material. This effect is further enhanced by her Bach inspired piano playing which adds a symphonic dimension to her performances, sometimes in rippling opposition to a legato melodic line or in a perky, contrapuntal development that meshes with the rhythmic accompaniment to produce a driving forward momentum that is pure swing. Her instrumental prowess is further demonstrated by a handful of instrumental pieces lurking amongst the vocal numbers and show what an accomplished pianist she was. Her utilization of classical elements was no mere gimmick but reflects her avowed veneration of Bach which she employs convincingly in the service of jazz. The delights are too numerous to dwell upon in detail but for me she communicates most directly and forcefully in a trio context where her often stark, soulful emotionalism is unfettered by string and brass laden arrangements not to mention vocal choruses. The accompanying booklet carries an essay charting her career, original sleeve notes and album artwork making the package an excellent acquisition for those who have only a passing acquaintance with her music and may be unfamiliar with her early work.